This mixer could be used for live mixing or in a small home studio. It comes with effects built in. The effects include a number of delays and reverbs, including a ping-pong delay. The reverbs have different variations that make it sound like an arena or hall. You'll also like the flanger and the chorus. The pre amps are great for the price range. They are very quiet and have a nice sound with plenty of gain. There no mute buttons on the channel strips which is a bit of a downer. 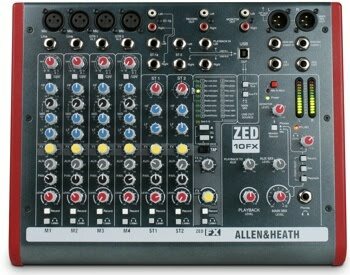 For more info visit Allen & Heath here. Musicans! Submit your music to these music networks. The sound from this mixer has made me have to listen to all of my tracks and other music again. It's that pure of a clean sound. Note: Don't cheat yourself with cheap connectors with this board. To do so will only be cheating yourself out of the sound it can truly deliver to your ears.